I don't know if anyone has noticed but we're getting little tweaks from the 1920's creeping back into our wardrobes! Think feathers, pearls, low necks, embellishments, waves and faux fur! The cloche hat is one of Radley's statement pieces this season, and Accessorize are heaving with embellished headbands. My work Christmas meal this year has a 1920's theme, so not only would it be great for me to do some research on this era of fashion, it would also be great for you guys to see what the 1920's women used to wear so your set and ready for when the trend is all over the runways! These dresses aren't 100% 1920's but it was the closest that I could find on the high street at the moment! Thank you, honey! 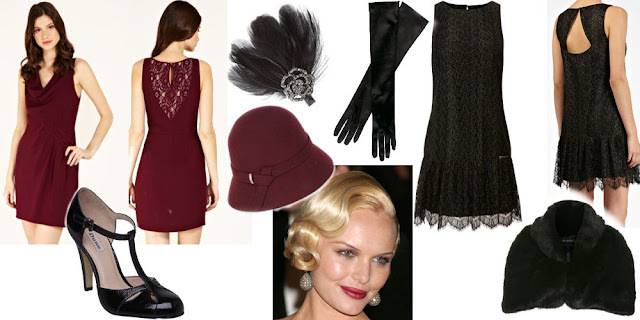 I love the 20s too :) I'm getting the long black gloves for the party!